The death of Gunner Rigby, mown down by a car driven by two Sub-Saharan Muslims and then cruelly butchered in the street, is not going to go away. And thank god or Allah for that, for the sooner Gunner Rigby is forgotten the more valueless his death becomes. There are powerful interests working day and night trying to devalue that death, trying to make it seem like a random, trivial act of insanity or a deed of extremism only endorsed by a tiny minority of fanatics; most importantly as an act that must never ever divide the denizens of Britain’s multicultural paradise (now available as a mental implant following lobotomy). As the cracks continue to appear thick and fast in the crumbling Victorian terrace house belonging to old Mrs. Britannia, the tendency to twitch the lace curtains and paper over the cracks grows strong and intense. The old lady who lives there, obsessed with the appearance of decorum, has no wish to get the builders or pest control experts in to fix the rot, rising damp, rats in the cellar, subsidence, or other structural problems in the decrepit structure. She feels that might reflect badly on her, and she is hoping to eke out her last few years in calm respectability, even if the rats gnawing away under the floorboards and the cockroaches scuttling around in the kitchen at night disturb her sleep. So, back to papering over the cracks! That’s what’s going on now. 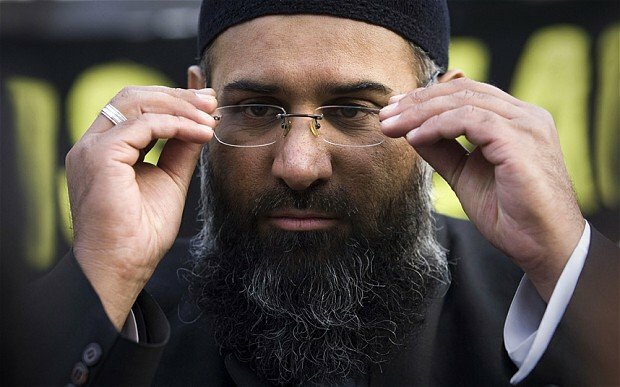 But some of the cracks are getting hard to hide – especially one by the name of Anjem Choudary, a self-appointed ‘holy man’ of Islam (like the religion’s founder), who routinely praises Muslim terrorists, celebrates the deaths of British soldiers, demands Sharia Law, exults in the demographic rise of the Muslims, and damns Britain and its rulers. Choudary played a large part in radicalizing Michael Adebolajo, one of the Woolwich attackers. Not only this, but he does it at the taxpayers’ expense, with the welfare state supporting him and his fast-growing family of unemployables. Calls are being made to sweep Choudary under the carpet, no matter how big a bump that makes, by excluding him from the airwaves. In the past, based on his exotic non-White appearance and the bias in favour of minorities at places like the BBC, he has been a frequent guest or interviewee on countless news programs or talk shows. Organizations like the Muslim Council of Britain, which are heavily funded (bribed) by the British government to present a “moderate” face of Islam to the British public, have also made noises denouncing Choudary. Pressure is also growing from some surprising sources, including Paul Golding of BNP splinter group Britain First, for Choudary to be arrested under the same anti-hate speech laws routinely used to muzzle British nationalists. All these people are either merely disingenuous or simply wrong. In their own strange way, no one’s words give greater respect to the death of Gunner Rigby than those of Anjem Choudary. This may not be immediately apparent, but if the death of this young soldier is to mean anything, then it is to signify, first, the pointlessness of a post-imperial country being involved in Imperialistic adventures, and, secondly and more importantly, the unworkability of multicultural Britain. Arresting, banning, or ignoring Choudary and his ilk, without moving to remove or reduce the Black and Muslim population of the UK would represent the mere papering over of cracks or at best the application of plaster and a bit of paint. In the long term this will not stop the house collapsing. Also, how do you propose to arrest, ban, or ignore a growing population of millions that will always feel alienated and oppressed, and which you can never control? Choudary is the unpleasant face of Islam, but he is also the true face, and for such honesty we should be deeply grateful. When we consider a purchase, it is nice to see a picture on the package. Who can doubt that as the Muslim and Third World population of the UK grows that incidents like the Woolwich atrocity will not become ever more frequent as the incomers first take over their chosen areas, as they have already done in many parts of Britain by setting up no-go areas, and then start to exert increasing dominance and intimidation of the declining indigenous population. Choudary’s words and Rigby’s death, to which they are so clearly connected, give us a clear foretaste of this at a time when it may still be possible to reverse such a horrific trend.